Round-trip transportation on scheduled airline. Three-day Metro pass in Paris (zones 1-3). Barcelona Metro Pass 10 Rides (Zone 1). All breakfasts. All dinners. Crêpes dinner on Day 3. Tapas dinner on Day 5. Paella dinner on Day 6. Explore the island that was the very heart of the ancient city which the Romans called Lutetia as well as the center of medieval Paris. Visit its most famous landmark, the Cathédrale Notre-Dame de Paris. It has presided over centuries of glorious and somber French history, from its construction in the Middle Ages to its desecration during the French Revolution, followed by the Coronation of 1804, when the 35-year-old Napoléon Bonaparte crowned himself Emperor of the French. Admire the sanctuary's bas-reliefs, statuary, gargoyles and remarkable rose windows. Cross the footbridge to the Île Saint-Louis, the second in the pair of islands on the Seine. This quiet enclave in the center of the city has always attracted well-known residents, from Voltaire and Baudelaire in past centuries to Président François Mitterrand and the intelligentsia in our time. Its main street is lined with fine restaurants, boutiques and antique shops. Don't miss Berthillon, the best ice cream parlor in Paris! Dinner this evening will introduce savory and sweet crêpes garnished with a selection of fillings. Travel into the western suburbs aboard a RER train headed for Versailles. If time allows, you may want to enrich your royal experience with an optional visit to the Petit Trianon and Marie-Antoinette's Hamlet, located within the grounds, about a mile and a half from the palace. Explore the park. Buy refreshments at a booth, or enjoy the picnic you may have planned earlier by purchasing typically French food at a market. In season, opt for a ride on the tourist train, rent a bike, or rent a boat to row down the length of the Grand Canal. Enjoy a walking tour on Paris's highest hill and its most celebrated bohemian district. Artists still flock to Montmartre's charming Place du Tertre, as they did when Toulouse-Lautrec painted the French Cancan dancers at the famous Moulin Rouge cabaret. Discover panoramic views of the city as you make your way up to the Sacré-Coeur for a visit to this white-domed basilica, which anchors the Parisian skyline. 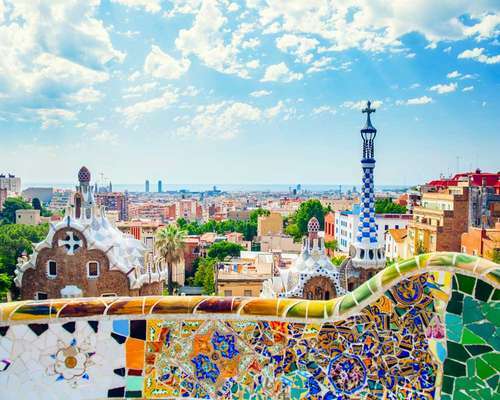 Enjoy the sweeping panorama of Spain as you fly to Barcelona, its chief port and second-largest city. ¡Bienvenidos! Since it hosted the 1992 Summer Olympics, this city has become one of Europe's most vibrant centers. Get acquainted with the string of shaded avenues stretched from the elegant Plaça de Catalunya to the Columbus Monument, which marks the spot on the waterfront where the explorer stepped ashore in 1493 after his voyage of discovery. Landmarks along the way include elegant palaces such as Palau Güell (designed by Gaudí in the 1890s and now a UNESCO Cultural Heritage site as one of the first Modernist buildings), the Opera House (Gran Teatre del Liceu, inaugurated in 1848), and Plaça de la Boquería, with the city's most colorful market. 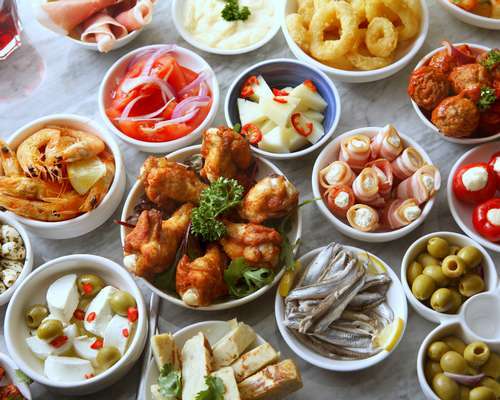 For dinner this evening, experience tapas, the delightful and varied snack-like servings, which are a specialty of Spain, there's something to please every taste! You'll go up Montjuïc Hill for a panoramic view of the city, the the colorful harbor district, and the Mediterranean coast. This evening, enjoy a traditional paella dinner. This typically Spanish dish offers a flavorful combination of the finest of rice cooked with spices, sauteed Mediterranean vegetables, and a choice of either chicken or seafood. Enjoy some free time in Barcelona today. Consider a stroll through the Gothic Quarter, Barcelona's medieval district. Its focal point is the great Gothic Cathedral of Santa Eulàlia (also called La Seu), known for its unusually wide nave and its cloisters surrounding a tropical garden. Other landmarks include the Palau de la Generalitat (Catalonia's Parliament), Casa de la Ciutat (the Town hall) and the ancient royal palace where Christopher Columbus met Isabel and Ferdinand upon his return from the Indies. Follow a professional chef on a tour of the Mercat de la Boquería, which has received the "Best Market in the World" award. It's proof that Barcelona is far more than the world's capital of molecular cuisine. The stalls are filled with a wealth of spices, seafood, meat and dairy, fruits and vegetables, bread and pastries, wines, as well as olives and cured hams. Next, join your chef around a kitchen counter and learn new techniques as you prepare tapas as appetizers, a main dish, and a dessert; all typical Spanish dishes, and all made with high-quality ingredients. Then, sit back and enjoy the meal you prepared. ¡Buen provecho! Enjoy a walking tour with your Tour Director in the tight maze of streets found in the Gothic Quarter, Barcelona's medieval district, where the focal point is the great Gothic cathedral. Other landmarks, all dating back to the 1300s, include the Palau de la Generalitat (seat of Catalonia's Government), Casa de la Ciutat (Barcelona's Town Hall) and the former royal palace where Christopher Columbus met Queen Isabella and King Ferdinand upon his return from the Indies in 1493. Several of the mansions now house museums. Nearby lies the medieval quarter known as Barrio del Born. Explore its maze of alleyways and squares, including Passeig del Born, where jousting tournaments were once held. This picturesque neighborhood, which is home to the Picasso Museum, has become a fashionable enclave within the old town.